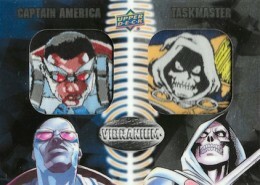 2015 Upper Deck Marvel Vibranium brings a reflective card technology to the Marvel Universe. Each hobby box includes one autograph, sketch or manufactured relic. 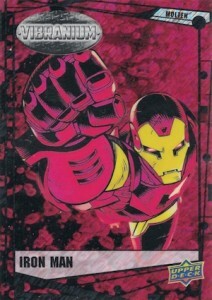 Treated as an annual look at the characters of Marvel, the product is built around a 90-card chromium base, with several limited parallels. The parallels showcase an Adamantium theme and include Raw (1:3 packs), Molten (#/299), Refined (#/99), Radiance (#/50) and Bar (#/5). 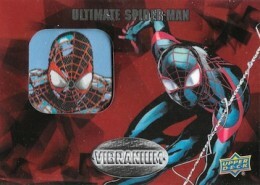 A variety of limited shiny inserts are also available in the product. In Memoriam, Hero Pow-Ore, When Worlds Collide and Universal Heroes each average one per box (1:13.5 packs). Rookie Heroes are the rarest insert at 1:27 packs. 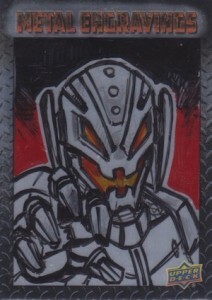 2015 Upper Deck Marvel Vibranium also offers collectors a mix of hit options. 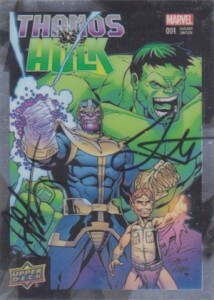 This includes Sketch Cards and Dual Comic Autographs. Manufactured Patches can also be found in Single, Double or Short Print form. 2015 Upper Deck Marvel Vibranium Molten Parallel 270 299 MATCHING NUMBER LOT! 25 cards. Short Prints (SP) noted below. SKT Jucylande Paula de Oliveira Jr.
Are the Bar parallel cards printed on super thick card stock? just popped a box I bought from Dave and Adam’s. factory sealed. I did not get any of the hits listed. No sketch, patch or autograph. 1 Bar parallel which is super thick and the pack contained 3 cards. the next pack was 1 card short also, but had a raw parallel in it.